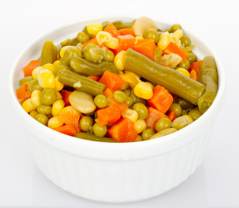 A mixture of fresh vegetables are selected, cut, graded and then blanched at a measured temperature. They are cooled immediately and then taken through Individual Quick Freezing. After sieving and thorough inspection, they are packaged. The packed cartons are fed through a metal detector and transferred to the cold store at -18° C. The entire process is carried out under strictly hygienic conditions. Colour Characteristic of the product as ingredient .As fresh colour of each ingredient.